Defcon One Publishing, 9780997793666, 144pp. Phantom limb surgery, dimensional windows, and sentient androids. These are but some of the strange tales to be found in this book. 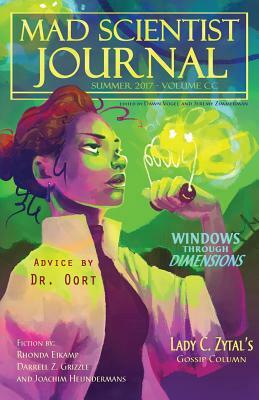 Mad Scientist Journal: Summer 2017 collects thirteen tales from the fictional worlds of mad science. For the discerning mad scientist reader, there are also pieces of fiction from Rhonda Eikamp, Darrell Z. Grizzle, and Joachim Heijndermans. Readers will also find other resources for the budding mad scientist, including an advice column, gossip column, and other brief messages from mad scientists. Authors featured in this volume also include Isaac Teile, H. E. Bergeron, S. Qiouyu Lu, Candida Spillard, Steve Toase, E. R. Zhang, Kaitlin Moore, Maureen Bowden, Wesley O. Cohen, Megan Dorei, Allison Spector, Sam Jowett, Domenic diCiacca, Melanie Atherton Allen, Andy Brown, Darci Vogel, Dawn Vogel, Dylan Vogel, Lucinda Gunnin, and Sean Frost. Cover art and layout by Amanda Jones.